Renowned for its iconic French Press coffeemaker and signature Scandinavian design aesthetic, BODUM has grown into a global housewares brand, with distribution in more than 55 countries. Headquartered in Switzerland, the company continues to develop all products in-house under its core principle that good design should be both functional and affordable. The range of products extends from coffee, tea and glassware to kitchen electrics and gadgets. 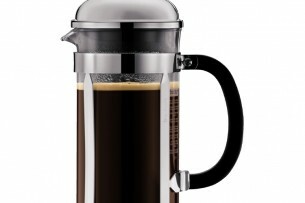 The French press system has always been the simplest and ultimate way of brewing an excellent cup of coffee. Using fresh coarseground beans with water between 92 and 96 degrees celsius brings out the very best in all types of coffee.